Hailing from the Middle East, DJ Sultan moved to Montreal, Canada in 1996 to receive an education in Mechanical Engineering and Business. While taking a break from studying Sultan found himself exploring Montreal's booming nightlife which quickly introduced him to his true calling as a DJ/ Producer. Sultan's destiny began to take shape in 2000 when Montreal's Mix 96 radio station entrusted him with the 12-3 a.m. Sunday night slot that ultimately spawned a weekly residency at club Living, opening and playing alongside such DJs as Deep Dish, Sander Kleinenberg, Danny Howells, Saeed and Palash, Max Graham, Nick Warren, and many more. By the time Sultan graduated from university in the summer of 2001 he had already experienced success as a resident DJ for the internationally renowned Club Stereo and Club Sona After Hours in Montreal. His accomplishments from behind the decks encouraged Sultan to build his own recording studio in an effort to thrust upon new avenues of creativity by perfecting his skills as a producer. The journey prompted Sultan to produce "Primal Instinct," which, after being picked up by Chug Records, immediately established him as one of the most innovative and respectable producers in the house/progressive scene. In the following years Sultan would continue increase his international fan base with four productions (including a remix) featured on Deep Dish's Global Underground 25 in Toronto, Tiesto's In Search of Sunrise 4, Dave Seaman's Renaissance-Masters Series Vol.7, and Deep Dish's George Is On, which features "Deep Dish vs. Dire Straits Flashing For Money (Sultan Club/Radio Mix)," a legal mash up/remix that's received praise from both the electronic dance world as well as rock legends Dire Straits. With all these accomplishments under his belt, it's no surprise that one of the biggest DJs to represent Montreal's modern clubbing scene decided to release a tribute to Canada's most exquisite city with Yoshitoshi Montreal. Preceded by Behrouz and Miss Nine's separate installments of Yoshitoshi Ibiza and Cedric Gervais' Yoshitoshi Miami, Yoshitoshi Montreal is the latest volume in a popular CD series to come from Deep Dish's legendary dance music label Yoshitoshi Recordings. The album opens with a smooth Sultan original track featuring vocals from the sensuous Zara titled "No Why (Sultan & Ned Shepard Rhodes Trip Intro)." As Zara's voice grabs the listener's attention with its beauty, Sultan gets your juices flowing with layers of lush beats accentuating her vocals that create sonic nirvana in the form of ear candy. Infectious piano rhythms surround Wharton & Lloyd's "Synphony," while Sultan takes his audience on a house music mountain hike as he speeds up the beat output during Valentino's "Flying" then drop it just in time for people to enjoy the spellbinding weightlessness of "Waiting For You (Steve Mac Classic)." Things get a little funky during DYAD10's "Sugar (Whelan&Di Scala Remix)," featuring hypnotic vocals from Julie Dennis, as Sultan starts the track with luminous tones before transitioning into a grimey thump that winds up taking the listener through a dark world sprinkled with specs of sweetness. Joe T Vannelli's "Prelude (Original Mix/Scalambrin & Sicily Remix (Island Style)" is another mash up mix that starts off as a typical club track but soon thereafter revisits old live versions of Orbital's "Halcyon On & On" as guitar samples from Bon Jovi's "Wanted Dead or Alive" create an awe-inspiring bridge which allows Sultan to easily transition into Suite 117's pumping "Smaller (Callea & Rispoli Club Mix). Sultan closes out this mix for the masses with a revamped version of his own classic "Night Visions." 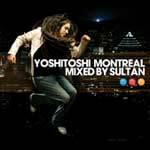 Sultan is responsible for putting the Canadian electronic music scene on the map, and this new Yoshitoshi Montreal is a great representation of his mixing capabilities and the Montreal vibe. After listening to Yoshitoshi Montreal you'll find yourself wondering how you ever lived without it.